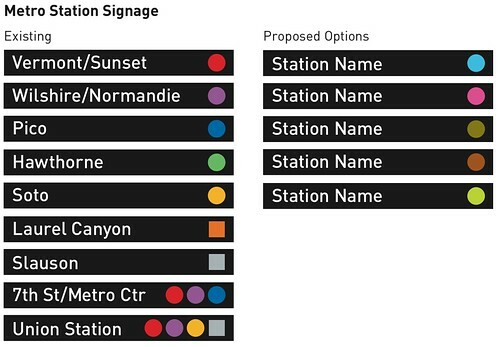 Reader poll: what color should the Expo Line be? As the project that is officially known as the Metro Rail Exposition Corridor (MREC) to Culver City, Phase 1 – informally referred to as the Expo Line – inches towards completion, an important decision still needs to be made: what will the line be called once it’s in operation? Why not just call it the Expo Line? The fact is, every other rail line on the system 1)has a color used to distinguish it on the rail map, and 2)is named after that color. Now, I’ve got the BIG box of Crayola crayons, the one with colors like “Electric Lime” and “Jazzberry Jam” and I still don’t know what color “Expo” is. In other words, to ensure consistency and to try and avoid passenger confusion, Expo has to become a real color. 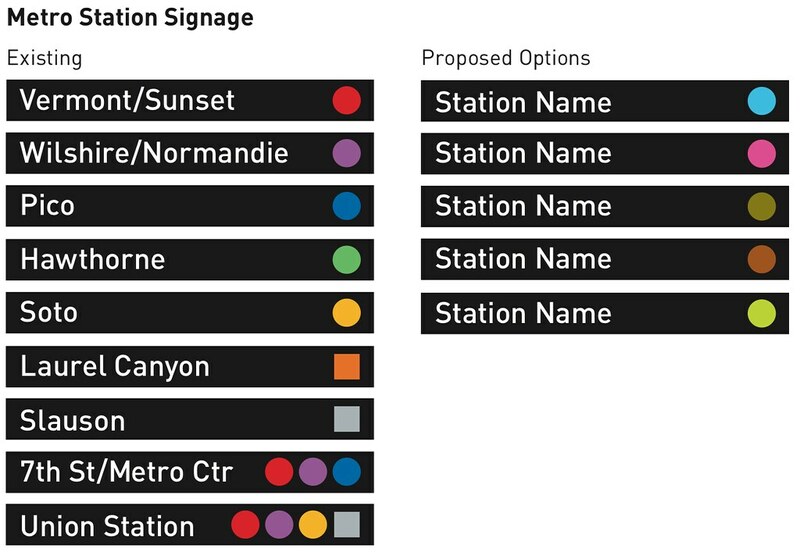 In the planning phase, the Expo Line has been represented as black line on the map – but there’s a whole variety of reasons why black is a poor choice as both a name and a distinguishing color on a map. So if not Expo, and not black, then what? Metro staff have proposed some options including: aqua, teal, olive, citrus, lime, copper, bronze, pink and rose. No formal choice has yet been made by Metro. Over the past four years, there has been community support for the Aqua Line, but others — including elected officials — have suggested different colors. In addition, there’s this issue of what happens when the Downtown Regional Connector gets built. The plan, at this time, is to run trains between Santa Monica and East Los Angeles on an east-west alignment and trains between Pasadena and Long Beach on a north-south alignment. In other words, if the line rail lines are “connected,” then does it make sense to designate the different limbs by different colors? Curbed LA covered the issue earlier this week, and the post received a slew of comments – many rally against the idea of color names in general, citing New York City’s naming convention of letters and numbers as ideal. While I appreciate where Curbed commenters are coming from, the fact remains that every urban rail system worldwide uses colors as the base for describing a line on a map – even New York City. Letters, numbers and symbols become handy as a system grows and the remaining color name choices become increasingly obscure (imagine riding the Jazzberry Jam Line), but as it stands now Metro is probably just fine alongside other agencies like MBTA, CTA and WMATA in using the color naming convention for rail lines. If I take one issue with Metro’s color naming convention, it’s the choice to use colors to label Bus Rapid Transit lines like the Orange Line and Silver Line. Although these bus lines can function in a rail like manner, the fact is they are not rail and, in my opinion, naming them in the same manner as the rail lines creates a potentially confusing inconsistency in the system. Plus it uses up valuable color names which moves us one step closer to the Jazzberry Jam Line.